Some planning ahead is required for this potato salad in order provide enough time to let the potatoes cool completely. I highly recommend making the extra effort and using homemade French dressing instead of bottled. Peel and quarter potatoes. Cover with water in a large sauce pan and bring to a boil. Boil cover 15 to 20 minutes or until tender. Strain and run cold water over potatoes. 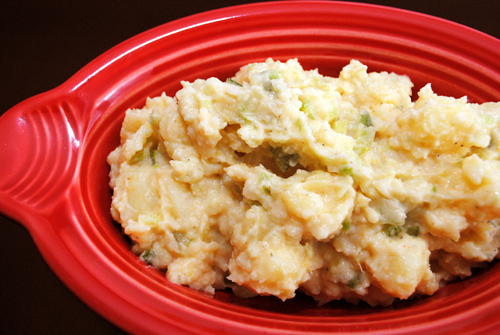 Transfer potatoes to the refrigerator and let cool completely, at least 2 hours and preferably overnight. Finely chop the onion, celery, and bell pepper and set aside. The onion should yield approximately 1/4 cup, celery 2 cups, and bell pepper 1/2 cup green bell pepper. Remove cooled potatoes from the refrigerator and dice. Add French dressing and mayonnaise and stir until well incorporated. Add onion, celery, and bell pepper and mix. Add salt and pepper, adjusting seasoning to taste. Serve Potato Salad cool or at room temperature, best accompanying barbecue recipes, like Barbecued Half Chicken and Barbecued Beef Ribs.